Part of the Qatar Foundation's Education City campus, Qatar National Convention Center (QNCC), designed by Japanese architect Arata Isozaki and RHWL Architects of Berlin, is one of the finest convention and exhibition centers in the world, and the largest in the Middle East. Located in the fast-developing city of Doha, its myriad of facilities - theatre, three auditoria, conference hall, 40,000m2 exhibition space, nine halls, and plethora of meeting rooms – are of the highest standard with a technical specification that is world class. Lee specified Martin Professional MAC 575 pattern and color changing moving head fixtures and Alien color changing downlights for the venue’s spacious entrance hall and VIP foyer. The VIP foyer area, a huge 280-meter long and 32-meter high space, features a stunning visual centerpiece in the form of a 250-meter long, curved steel structure whose shape is inspired by the Qatari Sidra tree. 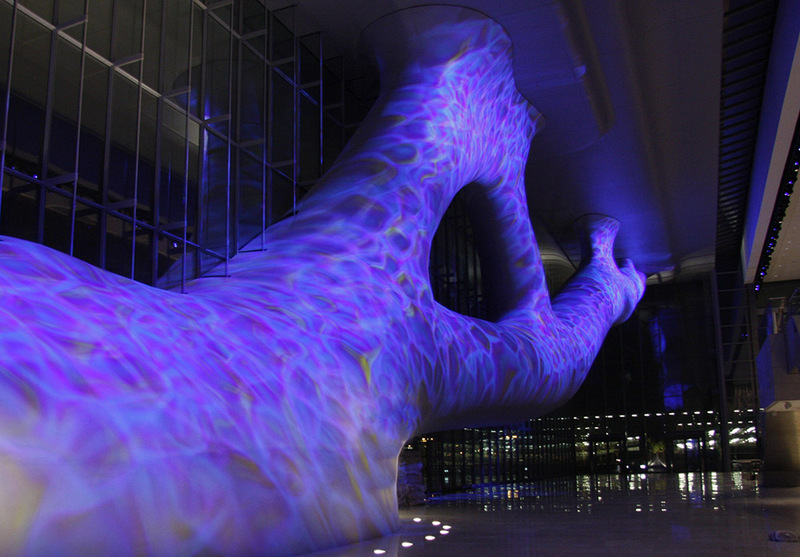 The tree symbolizes the Qatar Foundation's three key pillars of education, science and research, and community development. Lee has given it a dynamic drape of color and pattern using 280 MAC 575 fixtures, which are mounted in the ceiling on truss hoists. “As it’s a large glass-fronted building and passers-by can see the two huge Sidra trees from the highway, the interior lighting scheme is also the exterior lighting scheme,” Lee says of the view from the Dukhan Highway through the glass façade that stretches the length of the building. Various other lighting programs can be triggered including projection of Islamic patterns, i.e. tapestry on carpets, or an intense saturated red light complete with heartbeat sound effects, the heart of the building coming alive if you will. Another captivating lighting scheme involves a blue and white projection with stars that alludes to the birth of time. “I chose the MAC 575 for its versatility and the quality of the lamp,” states Lee, who also points to the importance of the fixture’s compactness, as well as having various colors and gobos in one package. The facility’s 2,300-seat, multi-level theatre has been securing dates for top theatre productions like Shakespeare's Richard III. Outside the lyric theatre is a unique, patchwork mosaic wall 32 meters tall with pinprick LEDs that look like stars. Here, Martin Alien color changers are used to cast even shades of color across the wall, saturated red for example punctuated with blue pinpoints of light. The effect is a visual treat. With the Education City educational campus, Qatar seeks to be a global hub for ideas and innovation by providing a first-class educational and research facility in the Middle East. The country is already hosting a series of high profile events, with more planned in the future, of which the Qatar National Convention Center is pivotal. Truly ground breaking in terms of a public building, the Qatar National Convention Center has set new standards as a world class facility and has emerged as the talk of the Middle East.